There is increasing evidence that kisspeptin, the peptide product of KISS1 gene and its receptor (GPR54), regulate reproductive processes through actions on other organs than hypothalamus. Therefore, the study for the first time, was conducted to investigate the nucleotide sequences and mRNA expression levels of KISS1 and GPR54 genes in pituitary, endometrium, ovary and oviduct of prolific Jintang black goat (JTG) and non-prolific Tibetan goat (TBG) during pro-estrus. By RT-PCR strategy, we obtained that the KISS1 cDNA sequence was 408-bp long, encoding a putative peptide of 135 amino acids. The GPR54 cDNA sequence was 244-bp long, encoding a putative peptide of 81 amino acids. There were two base changes in KISS1, and one base change in GPR54, but these base changes did not result in amino acid substitution between these two breeds. Real-time PCR analyses revealed that both KISS1 and GPR54 genes were expressed in all four tissues examined. KISS1 was most highly expressed in pituitary (p<0.05) and its expression was greater in JTG than TBG (p<0.05). In conclusion, a high KISS1 expression level in pituitary of prolific goat breed might be associated with its great litter size. The neurohormonal control of reproduction involves a hierarchical network of central and peripheral signals in the hypothalamic-pituitary-gonadal (HPG) axis. Kisspeptins are the peptide products of KISS1 gene (Lee et al. 1996), which operate via the G-protein-coupled receptor GPR54 (Ohtaki et al. 2001) also named KISS1R. These peptides have emerged as essential upstream regulators of neurons secreting gonadotropin-releasing hormone (GnRH), the major hypothalamic node for the stimulatory control of the HPG axis (Murphy et al. 2005; Novaira et al. 2009; Ohkura et al. 2009; Caraty et al. 2010; Navarro and Tena-Sempere 2012). Kisspeptin and its receptor, GPR54, play a pivotal role in animal reproduction (Seminara et al. 2003; Roa et al. 2008; Navarro and Tena-Sempere 2012; Vargas Trujillo et al. 2016). The central or systemic administration of kisspeptin increases GnRH and gonadotropin secretion in both prepubertal and adult animals (Navarro et al. 2005; Roa et al. 2006; Pielecka-Fortuna et al. 2008; Roa et al. 2008). Navarro et al. (2004) and Shahab et al. (2005) observed an increase of KiSS-1 and GPR54 mRNAs during pubertal development in experiments performed in intact rats and monkeys, suggesting that these developmental changes in the expression of KiSS-1 mRNA and GPR54 may play a role in the onset of puberty. Single nucleotide polymorphism in kisspeptin was found to be related to central precocious puberty in humans (Luan et al. 2007) and litter size in goat (An et al. 2013). Novaira et al. (2009) demonstrates that the kisspeptin-GPR54 system plays a significant role in stimulating GnRH secretion and positive regulation of GnRH mRNA levels in GnRH neurons in culture, and also, demonstrates the activation of MAPK and Akt signaling pathways by kisspeptin in two GnRH secreting neuronal cell lines. Pulsatile administration of kisspeptin evoked dramatic synchronous activation of GnRH gene transcription with robust stimulation of pulsatile GnRH secretion (Choe et al. 2013). A low-dose infusion of the peptide into the peripheral circulation of anestrous ewes reliably stimulates gonadotrophin secretion and induces LH surges followed by successful ovulation in more than 80% of females (Caraty et al. 2007). The photoperiod (i.e. day length), via melatonin, modulates KiSS-1 neurons to drive the reproductive axis in seasonal breeding species (Revel et al. 2006; 2007; Simonneaux et al. 2009; Ansel et al. 2010; Espigares et al. 2017). Mutations in the GPR54 gene are associated with hypogonadotropic hypogonadism (de Roux et al. 2003; Seminara et al. 2003). The anteroventral periventricular nucleus (AVPV)/the preoptic area (POA) and the arcuate nucleus (ARC) in the hypothalamus have been well documented as the action sites of kisspeptin-GPR54 signaling for reproductive regulation in mammals, however, there is increasing evidence that kisspeptins regulate reproductive processes through actions on other organs, including the pituitary gland, uterus, oviduct, placenta and ovary (Gottsch et al. 2004; Castellano et al. 2006; Gaytan et al. 2007; Richard et al. 2008; Radwanska and Kosior-Korzecka 2016; Uenoyam et al. 2016; Xu et al. 2016; Cielesh et al. 2017). In addition, there is little information about association between the variants and expression of KISS1/GPR54 with litter size in different goat breeds (Cao et al. 2010; An et al. 2013). Therefore, the present study, for the first time, compared the nucleotide sequences and mRNA expression levels in pituitaries, ovaries, oviduct and endometria for KISS1 and GPR54 genes between the highly prolific Jintang black goats (Capra hircus) and the non-prolific Tibetan goats (Capra hircus). All the experiments were performed according to the Regulations for the Administration of Affairs Concerning Experimental Animals (Ministry of Science and Technology, China; revised in August 2011) and approved by the Institutional Animal Care and Use Committee of Southwest Minzu University, Chengdu, China. The extreme high prolific breed of Jintang black goat (JTG, n= 5), and the non-prolific breed of Tibetan goat (TBG, n=5) were used in this study. The experiment was carried out in breeding season (October), and animals were kept under the similar conditions. All animals selected had same age (4 yr) and parity (four parities), and estrus were synchronized. The JTGs had a history of successive multiple births (≥ triplet births) and the TBGs had a history of successive single birth. All does were treated for 13 days with Controlled Internal Drug Release Devices (CIDR) containing 300 mg progesterone (Eazi-Breed CIDR, InterAg, Hamilton, New Zealand) to synchronize estrus. They were then slaughtered at 40 h after CIDR removal for collection of anterior pituitaries, ovaries, oviduct and endometria. Part of the removed tissue samples was snap-frozen in liquid nitrogen and then stored at -80°C to be used for RNA extraction. Total RNA was extracted with RNAprep Pure Tissue Kit (Tiangen, China) following the manufacturer’s instructions. Reverse transcription was performed using Thermo Scientific RevertAid First Strand cDNA Synthesis Kit in a total volume of 20 μL reaction mixture, which contains 5 μL RNA, Oligo(dT)18 primer 1 μL, Random Hexamer primer 1 μL, RNase free dH2O 5 μL, 5× Reaction Buffer 4 μL, RiboLockTM RNase Inhibitor (20 u/μL) 1 μL, 10 mM dNTP Mix 2 μL and 1μL RevertAidTM M-MuLV Reverse Transcriptase (200 u/μL) at 42°C for 60 min and 70°C for 5 min. The generated cDNA was then amplified using gene specific primers (Table 1), which designed based on the GenBank sequence. PCR amplification was carried out in a total volume of 25 μL of reaction mixture containing 1 μL cDNA, 9.5 μL ddH2O , 12.5 μL PCR Mastermix and 1 μL each primer. The PCR was performed under hot-start condition (94°C, 4 min) followed by 30 cycles at 94°C for 30 s, 59°C annealing of KISS1 (55°C annealing of GPR54) for 35 s and 72°C extension for 1 min, with a final extension at 72°C for 5 min before holding at 4°C. The PCR products were run on 1% agarose gel and analyzed under the UV illuminator. The products with expected size were cut and purified using Nucleic Acid Purification Kit (Axygen). The purified PCR products were ligated into a pMD19-Vector (Takara, Dalian, China) and transformed into DH5α (E. coli) using standard techniques. The products were sequenced by Chengdu Qingke Biological Technology (Chengdu, China). The sequences of goat KISS1 and GPR54 cDNA were subjected to BLAST analysis to verify that the sequence was of KISS1 and GPR54. The nucleotide and deduce amino acid sequence identity and homology was performed using the Clustal option in MegAlign (Lasergene Software, DNASTAR). The phylogenetic tree was performed using the MEGA 6.0 Software. The KISS1 and GPR54 mRNA expressions in tissues (ovary, endometrium, oviduct and pituitary) were analyzed by quantitative RT-PCR. GAPDH gene was chosen as housekeeping gene to correct potential variations in RNA loading. Primers specific for target goat genes (Table 1) were designed with Primer Premier 5.0 software. Real-time PCR was performed using the CFX96TM real-time PCR Detection system (Bio-Rad) in a 10 μL volume containing SSO Fast TM Eva Green Supermix 5 μL, 0.5 μL cDNA, 1 μL of each of specific forward and reverse primer, and 2.5 μL ddH2O. The PCR conditions were as follows hot-start condition (95°C, 3 min) followed by 40 cycles at 95°C for 10 s, 60°C annealing for 20 s and 65°C extension for 5 s, with a final extension at 65°C for 5 min before holding at 4°C. The baseline was used to determine the Ct (cycle threshold) in each reaction. The melting curve was constructed for each primer pair to verify the presence of one gene-specific peak and the absence of primer dimer. For the quantification, standard curves were generated by amplifying serial dilutions of each amplicon. The standard curve slope, translating efficiency (E) and the linear correlation (R2) were -3.393%, 97.1% and 0.999% for KISS1 gene, respectively, and 3.358%, 98.5% and 0.998% for GPR54 gene respectively. Each sample was tested in triplicate and the Ct of target gene was compared with the internal reference gene GAPDH. The Ct resulting from RT-PCR was analyzed by Pfaffl method (Pfaffl 2001). All data were expressed as mean values ± SEM. Statistical differences were assessed by Student’s t-test or one-way ANOVA followed by Dunn’s multiple pairwise comparison test. As expected, the goat KISS1 and GPR54 cDNA sequences were found to consist of 408 and 244 bp, respectively. They were respectively submitted to NCBI GenBank Accession Nos. KX586353 and KX586355 for JTG, KX586354 and KX586356 for TBG respectively. The coding region of KISS1 cDNA encoded 135 amino acids (aa) and the coding region of GPR54 cDNA encoded 81 aa. The goat KISS1 contains a putative signal peptide of 17 aa, located upstream of the sequence. There were two base changes in KISS1 (G to C at bases 231 and 403 from JTG to TBG, respectively), and one base change in GPR54 (T to C at bases 96 from JTG to TBG), but both of these changes do not result in amino acid substitution (Figures 1A and 1B). 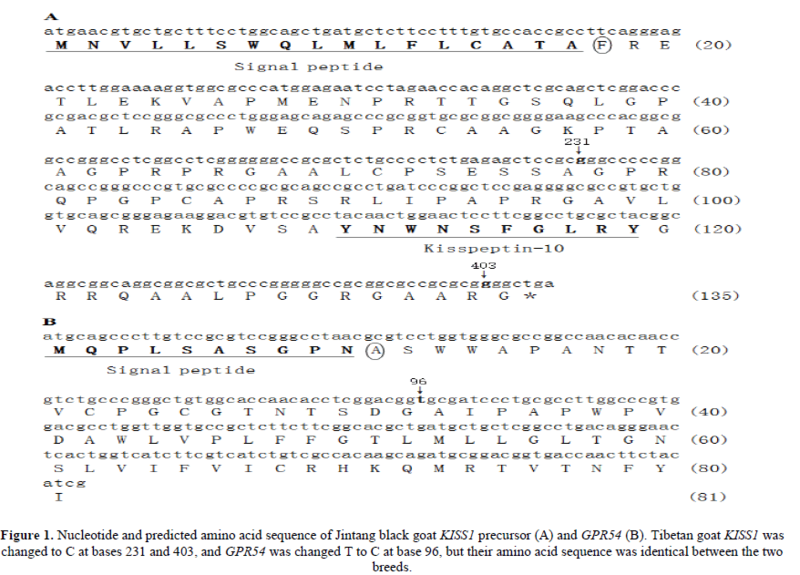 Figure 1: Nucleotide and predicted amino acid sequence of Jintang black goat KISS1 precursor (A) and GPR54 (B). Tibetan goat KISS1 was changed to C at bases 231 and 403, and GPR54 was changed T to C at base 96, but their amino acid sequence was identical between the two breeds. The nucleotide sequences as well as deduced amino acid sequences of JBG KISS1 and GPR54 were compared with the homologous sequences from other species (breeds) and the degree of identity is presented in Table 2. Identity of KISS1 with other species (breeds) ranged from Rattus norvegicus (71.5%) to Capra hircus (99.8%) at nucleotide sequence level, and Homo sapiens (61.9%) to Capra hircus (100%) at the deduced amino acid level. Identity of GPR54 with other species (breeds) ranged from Mus musculus (72.1%) to Capra hircus (100%) at nucleotide sequence level, and Mus musculus (67.9%) to Capra hircus (100%) at the deduced amino acid level. Comparison of the deduced amino acid sequence of KISS1 and GPR54 from JBG with those of other animal species (breeds) was shown in Figure 2. Figure 2: Alignment of the deduced amino acid sequences of Jintang black goat KISS1 and GPR54 with other animals. Identify to the consensus sequence is indicated by dots (-). All kisspeptin-10 amino acids were identical except for the last residue (Y or F), whereas at other region the sequence is highly diverse. The nucleotide sequences are used to construct phylogenetic trees by MEGA 6.0 Software. Cluster analysis of KISS1 showed that TBG was grouped together with JTG firstly, and then grouped together with Ovis aries, Bos taurus, Sus scrofa and Homo sapiens. TBG was grouped together with Rattus norvegicus finally (Figure 3A). Cluster analysis of GPR54 showed that TBG was grouped together with JTG firstly, and then grouped together with Ovis aries, Sus scrofa, and Homo sapiens. TBG was grouped together with Mus musculus and Rattus norvegicus finally (Figure 3B). Figure 3: Phylogenetic trees based on a nucleotide alignment of KISS1 (A) and GPR54 (B) constructed by MEGA 6.0 Software. Sequences were obtained from the NCBI GenBank database. The KISS1 and GPR54 mRNA were expressed in ovary, endometrium, oviduct and pituitary in both goat breeds. KISS1 was highly expressed in pituitary than in ovary, endometrium and oviduct (p<0.05), and the pituitary KISS1 expression of JTG was higher than that of TBG (p<0.05), while there was no significant difference in other tissues between these two goat breeds (Figure 4A). GPR54 was highly expressed in ovary than in pituitary, endometrium and oviduct (p<0.05), while it was no significant difference in other tissues between these two goat breeds (Figure 4B). 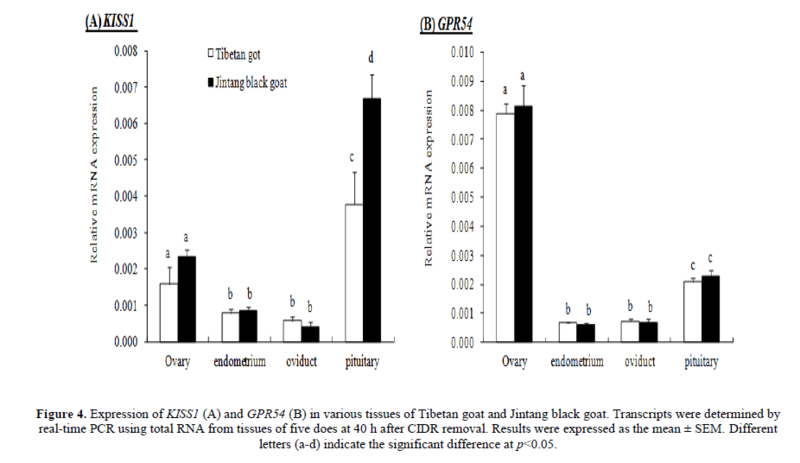 Figure 4: Expression of KISS1 (A) and GPR54 (B) in various tissues of Tibetan goat and Jintang black goat. Transcripts were determined by real-time PCR using total RNA from tissues of five does at 40 h after CIDR removal. Results were expressed as the mean ± SEM. Different letters (a-d) indicate the significant difference at p<0.05. The Jintang black goat (JTG) is a local Chinese breed famous for its high fecundity, polyestrus throughout the year and meat performance, while Tibetan goat is a single-birth and seasonal breeding breed. In this study, we compared the nucleotide sequences and mRNA expression levels in pituitaries, ovaries, oviduct and endometria for KISS1 and GPR54 genes during pro-estrus between these two breeds. The KISS1 cDNA sequence was found to consist of 408 bp, encoding a putative peptide of 135 aa, which is consistent with the consequence of Jining Grey goat (Cao et al. 2010). A nonsynonymous single nucleotide polymorphism (G54650055T) substituting one amino acid in kisspeptin (P110T) was found to be statistically related to central precocious puberty in humans (Luan et al. 2007), and four SNPs of KISS1 gene play an important role in litter size of goats (An et al. 2013). The GPR54 cDNA sequence was found to consist of 244 bp, encoding a putative peptide of 81 aa. There were two synonymous mutations in KISS1 gene and one synonymous mutation in GPR54 between these two goat breeds, but their association with goat fecundity needs to be further studied. The KISS1 and GPR54 cDNA sequences of JTG and TBG have a highly homology with Ovis aries, Bos taurus and Sus scrofa, etc. These results showed KISS1 and GPR54 have a highly conservatism in species. There are nearest kinship between JTG and TBG, then with Ovis aries, Bos taurus, Sus scrofa, Homo sapiens and Rattus norvegicus through the analysis of phylogenetic tree. The confidence of the phylogenetic tree is high, which conforms to the result of zootaxy. These prove the phylogenetic tree have a highest confidence. Expression of KISS1 mRNA in normal heart, brain, liver, lung, and skeletal muscle was undetectable by northern blot analysis. Weak expression was found in the kidney and pancreas, but the highest expression was observed in the placenta (Lee et al. 1996). However, KISS1 and GPR54 mRNAs have been examined in the brain, ovary, oviduct and uterus of various species of animals by RT-PCR (Gottsch et al. 2004; Castellano et al. 2006; Gaytan et al. 2007; Radwańska and Kosior-Korzecka 2016; Xu et al. 2016). In the present study, we found that both KISS1 and GPR54 mRNA were expressed in ovary, endometrium, oviduct and pituitary in JTG and TBG by RT-PCR. KISS1 was highly expressed in pituitary than the other tissues detected, and pituitary KISS1 expression of JTG was higher than TBG (p<0.05). GPR54 was highly expressed in ovary, but there was no significant difference between these two goat breeds. Several studies demonstrate that kisspeptin regulates GnRH and gonadotropin secretion (Navarro et al. 2005; Roa et al. 2008; Navarro and Tena-Sempere 2012; Choe et al. 2013; Vargas Trujillo et al. 2016) and links to seasonal breeding (Revel et al. 2006; 2007; Simonneaux et al. 2009; Ansel et al. 2010; Espigares et al. 2017). Kisspeptin can stimulate the quiescent hypothalamic-hypophyseal-ovarian axis of ewes in anestrus. A low-dose infusion of the peptide into the peripheral circulation of anestrous ewes reliably stimulates gonadotrophin secretion and induces LH surges followed by successful ovulation in females (Caraty et al. 2007; Sebert et al. 2010). Recent evidences also indicated that locally produced kisspeptins have direct actions in the pituitaries and ovaries independent of AVPV/POA and ARC in the hypothalamus. Kisspeptin receptor haplo-insufficiency causes premature ovarian failure despite preserved gonadotropin secretion (Gaytan et al. 2014). The intraovarian kisspeptin system may be regulated by sympathetic nerve activity and that the peptide, either from a neural or ovarian origin, is required for proper coordinated ovarian function (Castellano et al. 2006; Ricu et al. 2012). KiSS-1 and GPR54 genes are co-expressed in rat gonadotrophs, indicating that local effect of kisspeptin on the anterior pituitary gland cannot be ruled out (Richard et al. 2008; Radwańska and Kosior-Korzecka 2016). Therefore, high expression levels of KISS1 mRNA in pituitary of JTG may be associated with its high fecundity and non-seasonal breeding. 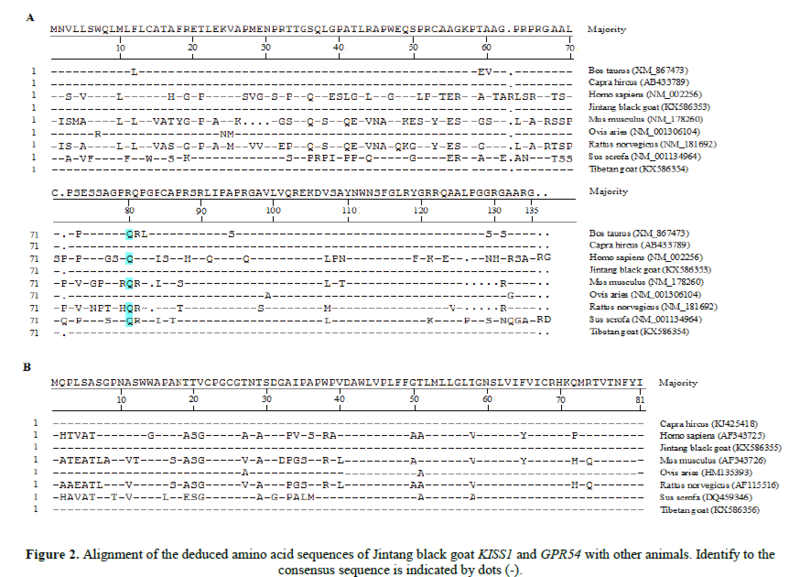 There were two synonymous mutations in KISS1 gene and one synonymous mutation in GPR54, but these base changes did not result in amino acid substitution between prolific Jintang black goat and non-prolific Tibetan goat. A high KISS1 expression level in pituitary of prolific breed might be associated with its great litter size. This study was funded by National High-tech R&D Program (2013AA102506), the Science and Technology Bureau of Sichuan Province (No. 2013JY0043). Caraty A, Franceschini I, Hoffman GE. (2010) Kisspeptin and the preovulatory gonadotrophin-releasing hormone/luteinising hormone surge in the ewe: basic aspects and potential applications in the control of ovulation. J. Neuroendocrinol. 22: 710-715.